Cutting wet grass in the spring is almost impossible to avoid. In doing so, I find that my lawn mower will often need wiped clean of grass that has accumulated under the mower deck, several times during use. 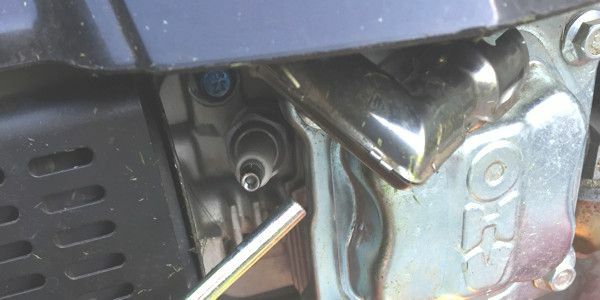 When doing so, it is very important to disconnect the spark plug from the “boot” that pushes onto the plug tip. This boot is easy to remove and easy to access from the side of the engine. Just simply pull on the boot to disconnect it from the spark plug! The picture below show what a typical boot looks like when disconnected. Get in the habit of disconnecting the spark plug so that you can safely clean under the lawn mower, with no worry of the blade spinning and creating a dangerous situation. This is an important step any time you are trying to scrap clean the mower deck whether the engine is hot or not. Thanks for reading everyone. Happy safe mowing!